"I gave it a try along side of several others and I liked the ease of use and format of this one best. I like to mix music and with this tool I can easily create loops and samples from pre-recorded audio sources like . I create the files in .wave format to use with some of my mixing programs later editing. It's very simple to set up and use". "I have downloaded the Shareware version of your renowed program "Audio Playback Recorder " some days back and liked it at first glance. I am using it frequently and enjoying its features and functionalities with great passion. Its 3D revolving window expression is unique and quite individual. What a real time recording facilities it have! Wonderful and Excellent! It's a unique program with a bundle of regular and special functions, placing it ON THE TOP in its category. ". "The fact that I got to try it out first. Also that it is very easy to record from records and tapes. Other software I have tried has recorded but there was always problems with playback, There was never any sound. This was not a problem with 3D MP3 Sound Recorder". "It has every feature that I want I'm very pleased with ease of use, excellent design of interface and controls. I especially like the timer and signal recording features.". "The ease of use, unique way rotates to do settings. I liked the user interface, ease of operation, and it looks for and configures the different inputs, just a nice piece of Programming!! I have tried several others and this is by far the best and easiest to use. Thanks for the good work". "I'll try many softwares like this. I was shearching one program that i can manipulate by a program that I did in Visual Basic 6. This program knows when a music change in winamp. Whan the title changes I must to stop recording a file and begin one auther with a new music. Many program have the fonction for the silence, so I can have a another file in mp3. The problem is the radio don't have spaces, so I can send a key (by programation) to the programmer recorder. I have a program that I buy a long time ago, but it is not cable to identify the key I sent in my program in VB. I began to download many programs and only 3D MP3 Sound Recorder G2 is able to a accept the key I sent by VB. Now I can go work and recording music for day long because I know anytime the title changes in Winamp my program send F8 to 3D MP3, I get the titles, artist, and the radio and I edit my new mp3 and after the new program began to the new music. 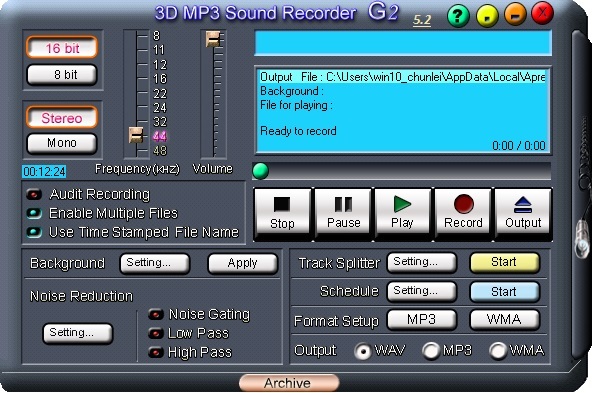 In my work I listen the music in my computer, but I know at home I recording it because now I have 3D MP3 Sound Recorder G2 the only program that can receive the hotkey send by my program in VB.	" "I have to say, being a hypnotherapist this is the greatest product on the market. It allows me to record my custom CD's for mixing with my music to give me a finished product to my clients. Keep up the good work and the upgrades are excellent." "So Far I am pleased with the program. I am installing it on my laptop to be able to record school concerts. On my desktop I use it for grabbing audio from my old cassette tapes. It works wonderful and I am very pleased with it. I have not tried to use it since I have unlocked it but I am anxious to do so. "i had been hunting a product to transfer my records to cd for a while. i have a fair amount of oldies and wanted to preserve them . i like the fact that it was all done in software and no additional hardware was required. its small and compact. and is priced within my budget. at present time i am still testing it, i believe it meets my requirements." You can find most controls for recording on the main interface, easy to use. when you first launch the software, it's ready to go ! --Select audio source for recording. --click the record button, it begins to record ! Chose to record from which audio sourec, either from microphone, line in , stereo mix or any others. The 5 record control buttons resemble the real cassette audio recorder buttons. Stop, Pause, Paly, Record, Eject(output). With Track Splitter™ technology, the recorded file can be splitted to serveral tracks automaticaly according the strength of the input signal. Multi-session schedule recording, you can set mutilple schedules based on specified date or day of week, each shcedule can be absolute or relative time, and has it's own URL to launch to record. Add background music to your recorded presentation. Enable you to record conversation of your voice chat and VOIP phone. Reduce the noise in real time when recording. All recorded files are archived, sorted by date time. you can also upload recorded files to share with your friends. Define any hot keys you like to control the recording.